We are one of the longest established UK specialists in Radio Commercial Production, Advertising Jingles, Copywriting and Creative Services for the Radio Industry. 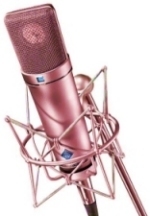 From our digital studios in Wiltshire, we carry out all types of sound recording specifically for the radio industry, from speech and vocals to multitrack music. Content © 2005-2019 Ginger Productions. Design © 2006-2019 TomDesigns.co.uk.